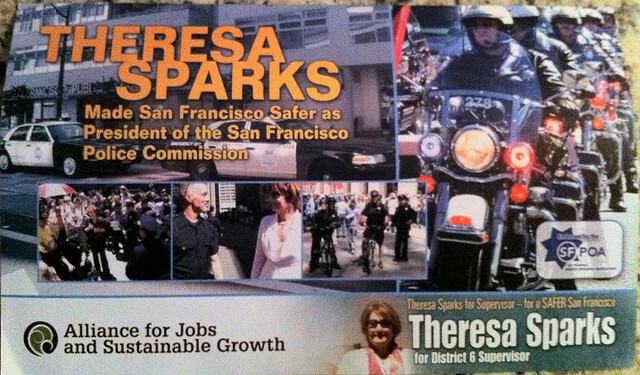 Does Theresa Sparks want to turn San Francisco into a Police State? That's the message I'm getting from her campaign literature. Seriously, front and back, this thing was chock full of policemen. It was like a Kristen Bjorn-fueled neo-con fantasy. Meanwhile, Jane Kim's flyer listed her ideas for District 6. Yes, it's shocking that she was able to think of more than just "I will protect you!" (ahem, Theresa). I'm torn. I thought Theresa seemed solid, grounded, with a sensibility we so often lack on the Board of Supervisors. I listened to her whole interview with Irina Slutsky. But, now I think Jane has pulled ahead for me. And why is Debra Winger running for office? Shouldn't she be making a film or something? My my my... its all politics in CA these days... I'm curious to see how all this drama plays out. I'm going to be in your neck of the woods next week. Anything I HAVE to see?